Rageshree is derived from the Khamaj family of ragas and traditionally its performing time is the second ‘Prahar’ (Segment) of the night. Its melodic scale altogether omits the note Pancham (Pa-5th) while the Rishabh (Re-2nd) does not figure in the Aroha or the ascending movement of the raga. Its vadi or the dominant note is Gandhar (Ga) While its Samvadi or the consonant note is Nishad – Ni. As Regeshree employs only 5 in its ascending phase (Aroha) and 6 notes in the descending phase (Avaroha), this is classified as an Audav Shaadav raga. According to the carnatic classic, “ Ragalakshana”, there is a marked resemblance between Rageshree of the Hindustani System and raga “Natakuranjika” of the Carnatic System rendering of rageshree has of course a flair of its own. 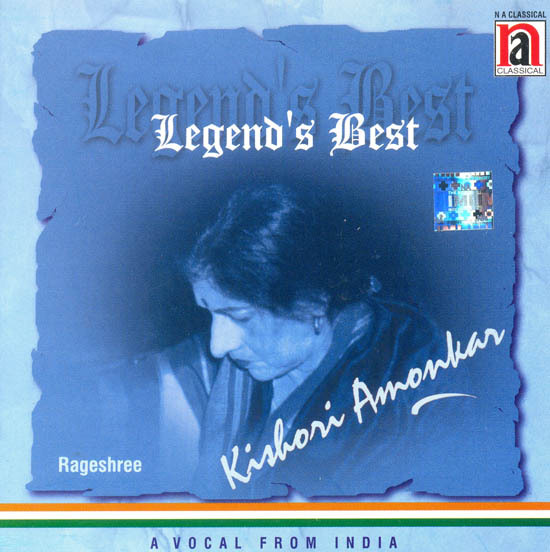 Ganasaraswati Kishori Amonkar is the undisputed Prime Donna of Hindustani Music who has been in the forefront among the contemporary generation of vocalists. Born with the legacy of Jaipur Ataruli Gharana given to her by illustrious mother. Ganatapasvini Moghubai Kurdikar, Kishor in turn has sought to evolve an individuality of her own with a tough spirituality. Her style founded on ‘Akhand Sadhana’ and a yearning to plumb profound depths of a creative artiste’s expression is at once eclectic and entrancing. Her performances proves to be a vibrant experience, If you can get attuned to her musical Wavelength because of her music is a revelation into her studies into the mysteries of ‘Kavya Shastra’, ‘Natya Shastra’ and ‘Adhyatma’. Thus her raga portraiture is marked by her highly individualist approach toward lyrical beauty. On the other hand, when kishori renders bhajans, She transports her listeners into a world of spiritual bliss which has earned her the blessings of saints and seers. Her cherished titled of Ganasaraswati was bestowed upon her by the jagatguru of Sringeri Math in appreciation of her music. Apart from this kishori and her illustrious mother share a rare distinction: they are the only mother and daughter recipients in the world of music to be honoured with the Padmabhushan Award. Such is their unique contribution to the Indian music as a whole.